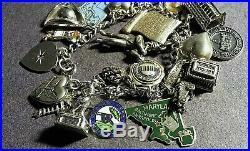 Vintage CURB Sterling Silver Charm Bracelet. History, Travel & Landmarks. Bracelet measures 7.50″ long with a “c clasp closure. 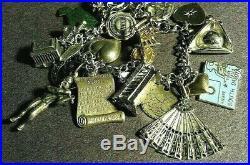 RARE 1930-40’s+ charms on bracelet with several unusual or hard to find items. 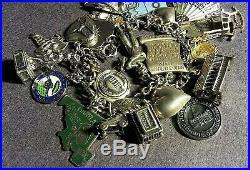 All the charms are stamped and/or sterling tested except the ENAMEL Raggedy Ann Doll. Military Puffy Heart, RN Caduceus. RARE Minute Man with rifle statue. Enamel Harpers Ferry, W. Klinke & Bates White Sulphur Springs, W. JMF ENAMEL State of Maryland, JP Cannon. Lincoln Memorial, Puffy Heart. RARE Lincoln’s Gettysburg Address. RARE Kinney John Hopkins School of Nursing. Religious Pendant, Large Filigree rocking chair. 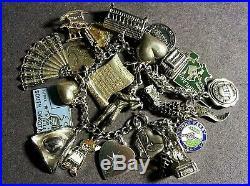 RARE Engraved love token (Victorian to the 40’s). Large Fan, ENAMEL State of South Dakota. Small puffy heart, 3D Colonial Tricorn Hat. RARE ENAMEL Raggedy Ann Doll, Red CZ Heart. 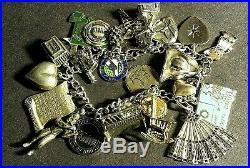 Bracelet and charms weigh approximately 64.8 grams. Pictures are considered part of the description. View more great items. 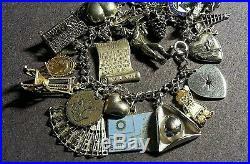 The item “Vintage 1940s Sterling Silver Bracelet with 23 Charms, 64.8g, Loaded, 7.5 History” is in sale since Thursday, March 7, 2019. 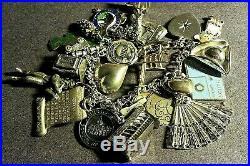 This item is in the category “Jewelry & Watches\Vintage & Antique Jewelry\Fine\Charms & Charm Bracelets”. The seller is “gofish145″ and is located in Plainfield, Indiana. This item can be shipped worldwide.